Wood is an economically viable and ecologically friendly alternative to the high cost of fuels that many villages, school districts and home owners face across Alaska. 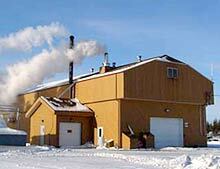 For commercial, industrial or large scale heating, a wood or combination wood/fuel boiler system is the best approach. Hot water can be piped long distances with minimal loss and multiple heat exchanges can be used isolate heating loops and hot water heating systems. Typical large scale installations feature a dedicated boiler building which houses the boiler(s), controls and fuel management systems. The following case studies provide a brief outline of existing systems which are applicable to many Alaska environments. They are intended to provide a basic understanding of what is possible and how cost effective a properly designed wood heating system can be. Due to the difficulty in determining labor costs some case studies no not include them. The products, trade names and systems listed are provided as examples only. UAF/CES does not endorse any product or system.